Results of effect of refining and inoculating with calcium-strontium carbonate and boron on the structure and properties of grade ИЧ220Х18Г4НТ heat- and wear-resistant cast iron are given. It has been found that the greatest enhancement of the properties is achieved when treating the iron melt with said carbonate in an amount of 5 kg/t with a boron content of 0.02%. This is due to degassing of the melt, desulphurization, globularization of nonmetallic inclusions and carbides, refinement of iron's structural components, enrichment of the metallic base with chromium. 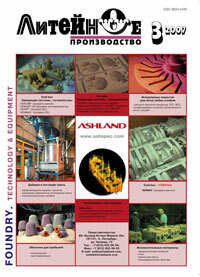 Based on a competition study of patent documents of the leading technologically developed countries in the field of modern sand mold casting technologies, the article discusses clay-bonded sand mold casting, cold-hardening sand and V-process technologies. Their advantages and disadvantages are discussed. Prospective development trends in those technologies are outlined. The article describes the advantages of the method "Cold-Box-Amin-Process" for manufacturing big cores as well as basic production stages. It describes a design and technical characteristics of basic core-making machines It shows stages of making and implementation of special-purpose complex of technological equipment for manufacturing big casting at RUE "MTZ", Minsk and JSC "Azovmash", Mariupol. Iron eliminators are used in the reclamation of used molding sands to protect equipment against breakage and to reduce metal loss in the sand to be disposed, and also in the separation of shot-and-sand mixtures in casting cleaning equipment. Most widely used are pulley-type iron eliminators, because they are highly efficient and relatively inexpensive. The article discusses the thermophysical processes running in a quartz sand lined squeeze chamber after pouring molten metal into it. Use of mechanical pressure when the melt solidifies in a disposable nonmetallic mold is unacceptable, because a hard-to-remove mechanical burn-on forms on castings, class of dimensional accuracy lowers, casting geometry is impaired. Therefore, mechanical pressure during metal crystallization can only be used for permanent molds, while in making castings in disposable molds combined or only gas pressure should be applied.